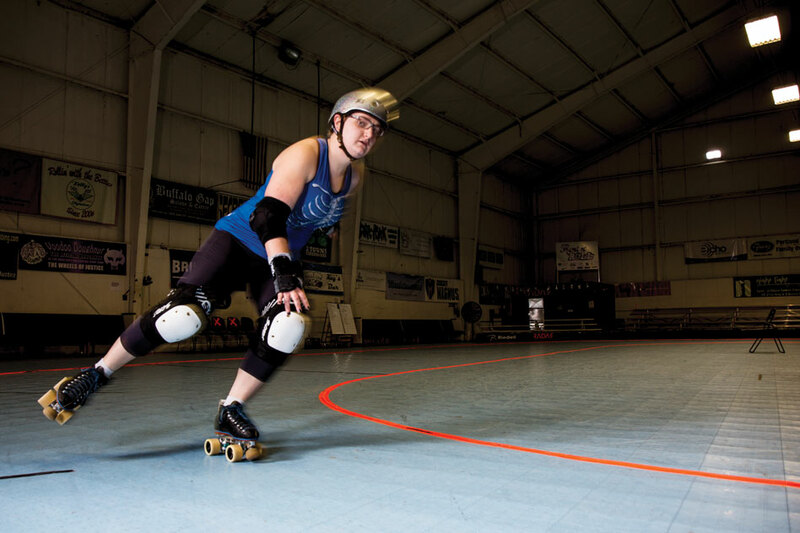 Jenna Routenberg ’18 as her roller derby alter ego, Sui Jennaris, skates in the Hangar at Oaks Park. Around campus, Jenna Routenberg looks like any other mild-mannered, library-dwelling lit major. On the windy January afternoon we met, she was ensconced in the office of Prof. Laura Leibman [English 1995–], surrounded by piles of readings for her junior seminar on the Southern gothic writer Katherine Anne Porter. But the black Carhartt jacket draped over her chair, bearing a logo of a bloody, winged heart and the words “Heartless Heathers,” served as a clue to her alternate persona—the hard-hitting, fast-skating roller derby terror known as Sui Jennaris. To some, the words “roller derby” may conjure up images of a midcentury spectacle that was less sport than pageant, revolving around scripted storylines and predetermined outcomes. Not any more. Following a grassroots revival in the early aughts, the modern sport is real, and its participants—almost exclusively women—are deadly serious. 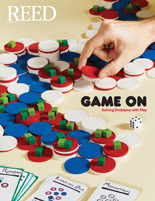 It’s a game of skill, strength, and speed, where two teams score points by getting a designated player, called a jammer, through the scrum formed by the other players. While the jammers juke, hop, and occasionally shove their way around the track, the rest of the team tries to block their opponents by linking arms to form walls, and, if it comes down to it, slamming them to the ground. That’s Jenna’s job. Jenna is the personification of a Reed archetype—the gifted oddball who nearly fell through the cracks. “It was always my plan to go to a place like this,” she remembers. But when Jenna was in high school, her mother suffered a serious injury in a car accident and never quite recovered. One morning, Jenna woke up to find her mother had died during the night. She put her dreams on hold. The stress of living with her mother’s health problems, on top of a home life she describes as “toxic and abusive,” triggered a series of physical and mental health issues, which she struggled with for years. Somewhere along the line, she found out that Reed no longer imposed an application fee. That got the gears turning—maybe she didn’t have to give up on her dreams. She figured she might as well apply—and crossed her fingers that the college could offer enough financial aid to put a Reed education within her reach. “Miraculously, I got in,” she says. Since then she’s developed close relationships with Prof. Gail Sherman [English, 1981–], Prof. Pete Rock [English 2001–], and especially Prof. Leibman. Last summer, she traveled to Barbados with Prof. Leibman to do research for a Ruby-Lankford grant. She and Leibman sought to examine the impact of religion on the fight for civil rights among freedmen in Barbados. “In the first half of the 19th century,” Leibman says, “non-Anglican religions on the island were commonly blamed for causing civil unrest among the slaves and free people of color.” By poring through early petitions for rights, they showed that those old ideas about who was agitating for civil rights were misguided. Another result of the research was an online database that greatly expands the genealogical information available for families from the island. Where previous work had focused mostly on wealthy white families, Jenna and Leibman obtained wills, estate inventories, and other records for many free Afro-Barbadian families. It’s game night. The season-opening doubleheader will kick off with a showdown between the Heartless Heathers and their archrivals, the Break Neck Betties. I find myself jammed into a bleacher packed with red-and-black-clad Betties fans. A bearded guy in a red bandana sounds like he wants to start a fight with the refs every time a whistle blows. On the track, it’s a close, back-and-forth bout. The Heathers like to play a defensive game, but they’re struggling to contain Beyond Thunderdame, the Betties’ new jammer. She’s tall and fast, and keeps using her height to elude the Heathers’ blockers. By putting two top players on Dame, the Heathers keep her in check, and they start to pull away late in the second half. Final score: Heathers 241, Betties 205. Once the glow of victory fades, it’s time to hit the books. Katherine Anne Porter is calling. It’s probably not what her teammates are reading, but that’s OK. After all, she’s Sui Jennaris—she’s on a track of her own. —Author info: Katelyn Best ’13 wrote her thesis on Nicaraguan Sign Language and is now a freelance sports writer in Portland.